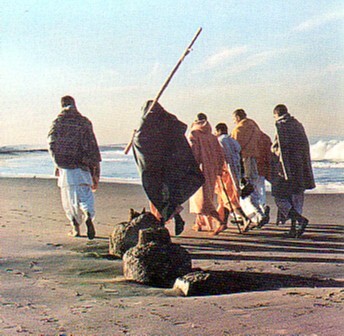 Srila Prabhupada Speaks out Independently You Cannot Be Happy The following conversation between His Divine Grace A. C. Bhaktivedanta Swami Prabhupdda and some of his disciples took place in October 1975 during an early-morning walk in Nairobi, Kenya. Srila Prabbupada: [Taking the role of an atheist. I By pleasing the spiritual master, you please Krsna. That’s nice. But why should Krsna be pleased? Why should one bother himself to please Krsna? Answer this. Devotee:Because our real position is to serve Krsna. We’ve fallen into the illusion of this material energy because we forgot our position as His servants. Srila Prabhupada: We are making scientific progress. What is the use of bringing God in? Devotee:	Because we shall never become perfect if we don’t serve God. Srila Prabhupada: That is begging the question. Devotee:Everybody has to serve some­body. Since Krsna is the reservoir of all pleasure and everything emanates from Him, instead of serving some ordinary person we should serve Krsna. Srila Prabhupada: But without serving Krsna, I am getting pleasure by drinking wine. Why shall I serve Him? That pleasure will not last; it is only temporary. Srila Prabbupada: But I also will not last. So I am enjoying wine while I can. Devotee:	But such a mentality is third class. Actually, our life is eternal. Devotee:	Krsna says in the Bhagavad­gita [10.101, “To those who are constantly devoted to Me and worship Me with love, I give the understanding by which they can come to Me.” So, this is our desire. 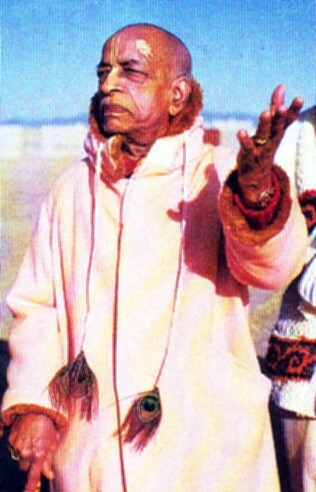 Srila Prabhupada: I don’t want to go. Devotee: You don’t want to go to Krsna? 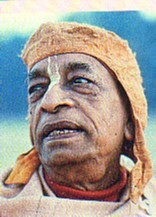 Srila Prabhupada: You are putting upon me some impression—”suffer”—-but I am enjoying. Devotee:	Your knee is hurting. Is that enjoying? Devotee:	It is said in the Bhagavatam that we are just like the limbs of the body and that Krsna is like the stomach. All the limbs may be jealous of the stomach and not want to feed the stomach, but if the hands and legs and mouth were to go on strike and not feed the stomach, they would ultimately be destroyed. 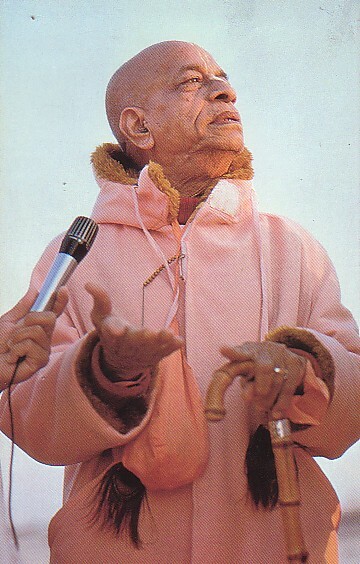 Srila Prabhupada:	This is the right answer. Every limb of the body must cooperate with the stomach. If the finger thinks, ‘‘I shall remain independent and be happy, that is not possible. The stomach must be supplied food, and then all the other parts of the body will be happy. Similarly, Krsna is the central enjoyer (bhoktaram yanjna-tapasam He is the center of everyone’s activities, just as this African state is the center of people’s activities here. If you do not satisfy the state—or the president—then you cannot remain happy. Independently you cannot be happy. For example, we have come to this park because the state is maintaining it. We have not gone to the jungle. So if we actually want happiness, we must cooperate with the state. Similarly, if our ultimate aim is to become happy, then we must cooperate with Krsna. This is obligatory. You cannot escape it. If you try, you’ll be unhappy. Devotee:	We are part and parcel of Lord Krsna. Srila Prahhupada: Yes. Even a child—he will naturally bring everything to his mouth. He picks up something, but he does not put it anywhere. Immediately he puts it in the mouth. Why doesn’t he put it in the ear? He doesn’t know what is what, but as soon as he gets something, he puts it in his mouth because his position is eating. He knows—”Taste with the tongue and eat.” He hasn’t got to be educated. So, our position is like that. Being part and parcel of Krsna, we have a natural tendency to serve Him. Serving Krsna is not artificial. When you forget Krsna, that is artificial. Our normal life is to love Krsna, to serve Krsna. That is our normal life. Without our serving Krsna life is abnormal, a madman’s life. therefore Krsna comes to this world to preach normal life: sarva-dharman pari tyajya mam ekam saranam vraja. “Give up all other so-called duties and simply surrender unto Me.” This is normal life. Krsna doesn’t require our help. He can create many helpers. But for our good Krsna comes and says, “if you want a normal, happy life, then surrender unto Me.” This is His proposal. Devotee:	But Krsna is not here now to give us this normal life. What are we to do? Srila Prabbupada: Therefore Bhagavad­gita and all other Vedic literatures are there to remind us of our forgotten position—to love and serve Krsna. krsna bhuli’ sei jiva andi-bahirmukha ataeva maya tare deya samsara-duhkha We cannot ascertain when we have come to this world, but from time immemorial we have forgotten Krsna, and life after life we are changing bodies and suffering. So here, in the human form of life, there is the opportunity to revive our original position. But we require the help of knowledge, perfect knowledge. That is available in the Vedic literature.So, we may read the Bhagavad-gita but if we don’t take advantage of its knowledge, and if we go on acting whimsically, then we will suffer. You cannot avoid cooperating with Krsna. You must cooperate. There is no question of an alternative. You must cooperate; otherwise you’ll never be happy. Our aim of life should be to end misery (atyantika-duhkha-nivrttih. For example,I’m suffering from this knee trouble ,because I am in this material world, because I have this material body. So, atyantika­duhkha-nivrttih means no more material world, no more material body. And no more misery. And for that purpose we have to cooperate with Krsna; otherwise it is not possible to end our misery. Thank you very much!This was said ,by His Divine Grace A.C.Bhaktivedanta Swami Prabhupada, talking with A group of Disciples,Asking Questions, that regular People, Would have asked,So He could Answer Your Questions! !